Advanced technologies that have become the gold standard in observing and managing stress reactions in cardiology, sports performance and psychology practices are now available to chiropractors. Heart Rate Variability (HRV) testing is a simple and accurate test that uses complex mathematical calculations to analyze the rates and rhythms of the resting heart beat pattern. The data can be evaluated to reveal the intricate balance between the Sympathetic (S) Nervous System and the Parasympathetic Nervous System (PS). 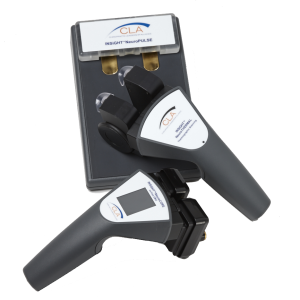 CLA has developed a proprietary HRV technology specifically for chiropractors. 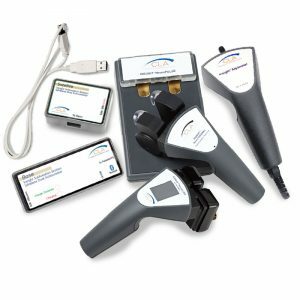 The Pulse Wave Profiler (PWP), or neuroPULSE is research-grade equipment that allows the staff or doctors to quickly assess the effect that long term stress is having on the general state of a patient’s well-being. Conversely, a PWP scan is an ideal way to monitor the overall improvements accomplished while under chiropractic care. It is a perfected technology that allows the clinician to measure and discuss the vital changes while inspiring the patient to continue towards wellness care. HRV testing has become a significant tool in developing retention and compliance within a practice. The PWP is unique because of its patented technology combination that measures HRV while monitoring anxiety levels. 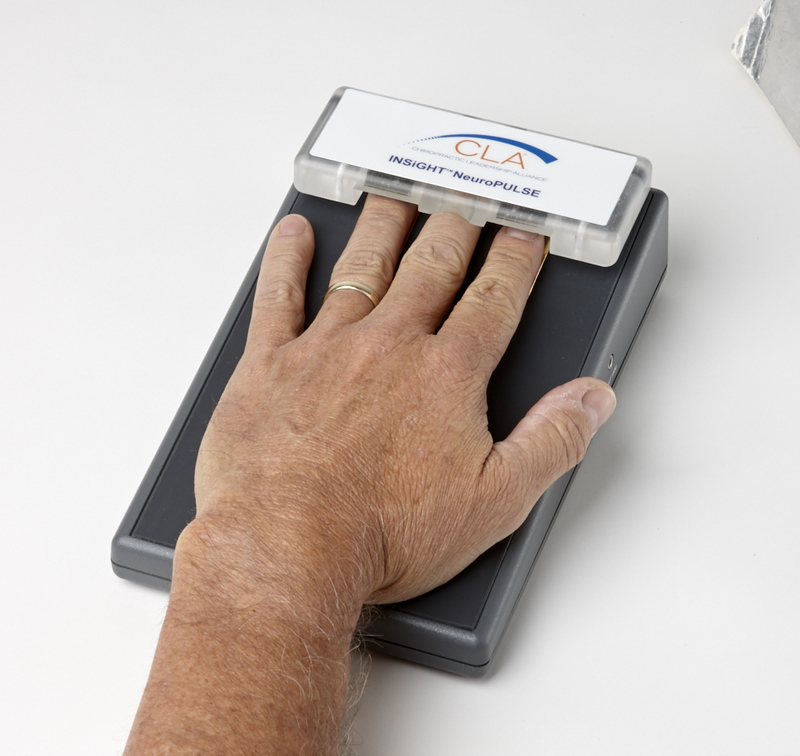 An embedded Galvanic Skin Response (GSR) measurement ensures that collection of data is accurate and reproducible. The six minute, unattended test with a patient’s hand cradled on a sensing platform captures the full spectrum of the heart rate and rhythms. The origins of Heart Rate Variability go back to clinical studies 40 years earlier. At that time the ANS was viewed through a Stimulus – Response model and not examined as a complete system interacting with psychological and physiological factors. Polygraphs were the first bridge to “show” how an emotional state impacted on the physiology. In those years the accuracy of measuring the heart’s R-R interval was limited and so HRV was relegated as an anomaly. With the advent of digital processing, the milliseconds of the interval and the degree of variability can be acknowledged as accurate. Simply put, HRV is a representation of the balance existing between the Sympathetic (S) and Parasympathetic (PS) portions of the ANS. If there is increased regularity of the heartbeat there is decreased variability and vice versa. The heart rate is measured using ECG’s or pulse wave profiles (plethysmograms). Increased S-tone relates to decreased variability. Increased PS-tone increases variability. An increase in variability is synonymous with the increased adaptability to environmental stimuli. A decrease in variability has been linked to any number of pre- degenerative or morbid, deteriorating physiologic states. HRV is not an exact diagnosis of disease but rather an indicator of the present state of adaptability. Chronic increases in health risk can be observed and reported when sequential HRV reading are obtained. The ANS is involved in all disease states and is inherent in promoting a desirable state of wellness and performance. By producing hormones such as adrenaline and glucocorticoids, the sympathetic system stimulates a fight-flight response. The heart rate increases and the vasomotor tone of the periphery constricts (as seen in para-spinal thermal scans). A “vagal brake” is applied by the medullary circuits ending in the myelinated, vagus nerve. This slows down and rhythmically balances the heart rate. Chronic stress leading to dis-stress will swing the balance and reduce the variability. An increased S-tone is associated with overt or quiet inflammatory states. A chronic skewing towards the S side indicates a lowered PS response. The PS readings can be viewed as an indicator of the level of the restorative response. Low PS and higher S readings combined with a low variability indicate a declining state of health and adaptability. One can easily identify the amount of “reserve” a patient has by looking at the amount of variability. If there is a low level of reserve then the patient is more vulnerable to negative type stress. Natural systems are nonlinear in their response to stimuli. The randomness of this response spawned the Chaos Theory which is defined as the study of multivariable, non-periodic and nonlinear systems. The heart rate is, by design, slightly variable, due to the Respiratory Sinus Arrhythmia (RSA). Fractal or quantum analysis is necessary to account for the non-periodic measurements of this variable system. It is likely that the fractal analysis of HRV is incompatible in the comparison of the linear analysis of thermal scanning. This is most likely why we can observe regional, sympathetic responses and still get relative balance in the S-PS HRV readings. Thermal scanning shows the “load” on the regional circuits and the sensitivity of the “adrenaline” response in those regions. HRV takes a bird’s eye view of the totality of the adaptive state. It can be a qualitative measure on overall response to the wellness lifestyle strategies that are being enacted. HRV is the gold standard in analyzing the status of the adaptive state of the individual. Multivariable, non-linear events play upon the psychophysiology of everyone. You can now benchmark their current status and report, with accuracy, the direction they are headed. Chiropractic has been proven (Zhang studies) to positively influence the variability as measured using HRV. Combined with regional readings showing the patterns of memorized adrenaline load (Thermal scans) we can track the emerging state of health and discuss wellness options with our patients. Adding in the sEMG can tell us the energetic efficiency (dysponesis) and help us to understand where the wasteful, paraspinal motor response is occurring. Using inclinometry and algometry to complete the spinal-neural profile, we can inspire the patients to take their spinal core dynamics seriously help them understand that back pain is not the issue at hand. We are so much more important to the world than to relegate ourselves to the role of a therapist, helping people through awkward episodes of pain. We are the thin edge of the wedge, managing and promoting performance of human potential. Remember, chiropractic has spent the past 100+years researching how to release the inefficient constraints on the expression of the neural image. We offer society the most advanced perspective and the simplest solution (the adjustment) to balancing the ANS and reducing noxious load on the central neural processor. Please take yourselves seriously and tell the whole story. The world can be a better place with less subluxated people in it because of you.